I recently bought this Spellbinder's nestablilities star die and really didn't know what to do with it. So I challenged myself to see what I could come up with. I didn't use all the sizes as it would of been overkill. The first one is cut out of acetate and the rest are cut from cardstock. 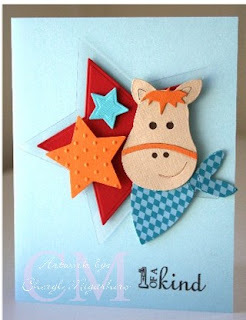 I only embossed the red and blue star and used the Cuttlebug swiss dots to emboss the orange star. 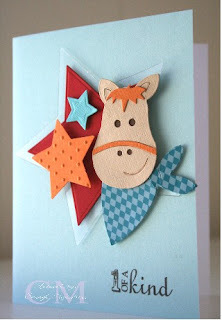 That cute horse die is a new one from Sizzix. Stamp is Hero Arts. You're probably wondering why there are 3 photos but I wanted to show you the card in different angles. I am busy cleaning out my house today even though it is a holiday weekend. I can't believe how much stuff I've accumulated in the past year. And while I was outside getting my laundry, I saw a mouse running under my washer (I think it's a mouse). Yuk! I hate those little critters. So now there is sticky traps going around my washer. Well, back to cleaning and hope you're all having a wonderful holiday weekend! Cheryl! This is fricken CUTE!!!! 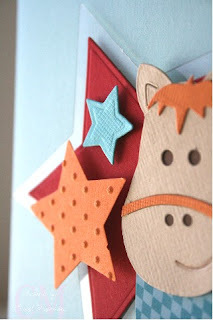 I love it.. the stars... the horse is sooo damn adoryable!!! I didn't wonder about the 3 photos, I totally understand what you were getting at. Love it!!! Hey cheryl! I love this! You outdid yourself on this one. I love all of the sizes for the stars, drats! now I have to get that nesties too? ?